The free downloadable app provides users with the ability to enter their detailed material handling specifications. The calculator measures a number of user-specific variables including fuel efficiency, run times per cycle and speed advantage per cycle. 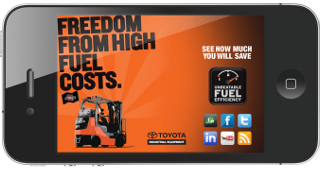 For those seeking a traditional interactive tool, an online Forklift Fuel Efficiency Calculator option is available at www.toyotaforklift.com.